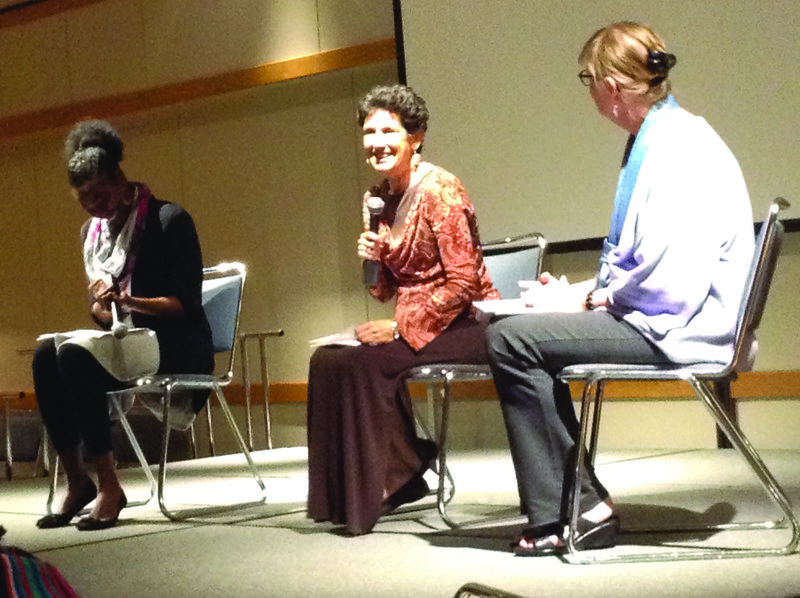 As part of an ongoing series, Children of Abraham, three local faith leaders, Dalia Abdul Rahim, of the Tristate Islamic Center; Bonnie Sue Lewis, of Westminster Presbyterian Church and University of Dubuque’s Seminary; and Phyllis Garfield, of Temple Beth El, led a discussion on supernatural beings in the Islamic, Christian and Jewish faith traditions, respectively. “They are not speaking for their traditions, they are speaking from their traditions,” Dr. John Eby said of each of the speakers. He opened the presentation by likening it to reunited a family. Children of Abraham, which is an ongoing series of lectures and discussions about relations between these faith traditions, is in its fifth year. Abdul Rahim began the discussion with an overview of the Islamic beliefs about angels, demons and Jinn. Jinn are the least known in western culture, having no parallel in Christian or Jewish thought. The name Jinn derives from an Arabic word meaning to hide or be hidden. “They live in a parallel universe to ours,” according to Abdul Rahim, and are made of smokeless fire as opposed to human beings who are made of clay. Like human beings, they were made by Allah with free will and made to worship Him, and likewise can be either good or evil. Demons in Islam are not fallen angels, but rather Jinn who have chosen evil. The origin of Shaytan or Satan is in a Jinn named Iblis. Iblis refused to bow to Adam, as he perceived himself as a higher order being. For disobeying, he begged not to be punished on the spot, but on Judgment Day, so that in between he may act as a tempter to mankind, proving they were not worthy of his bowing anyway. Demons are those Jinn who follow him. Angels, or Malak, in Islam do not have free will and are messengers to mankind. The most important of them in the Quran is Jibril, or Gabriel, who appeared to Mary as well as all of the prophets. Lewis spoke from a Presbyterian Christian perspective on angels and demons and their respective origins. She acknowledged that while angels and angel imagery are very popular today, most of what the public knows is a spinoff of Christian tradition of angels. Angels are created beings, usually in God’s presence, singing his praises. The Hebrew word for angel mirrors the Arabic, Mal’ek, which translates into the Greek angelos, meaning messenger. “It is only by God’s permission they interact with humankind,” said Lewis. Demons, in Christian theology, are fallen angels. Satan was created as an angel of light, but turned against God, and demons are those angels who follow him. Garfield, of Temple Beth-El, spoke on behalf of a Jewish perspective. Angels are mentioned very little in the Torah, but are mentioned more specifically in the prophetic books, most notably the book of Daniel. Jewish angelology developed a more defined angelic hierarchy well into the middle ages as the Jewish people came into contact with other cultures. Contemporary Jews of the reform and more liberal variety, tend to place little emphasis on angels. “God has given us a job to do in this world,” said Garfield. Angels, in way, are less valuable to God in that they cannot choose to worship Him. There is a Jewish prayer, the bedtime sh’ma, which invokes angels to protect the sleeper during the night. 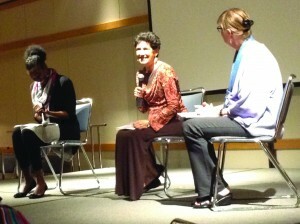 The rest of the evening was open to questions and provocative discussion between the speakers and the audience. All came away with a greater understanding of tremendous importance of these celestial beings in the Abrahamic tradition. The next events for Children of Abraham include the one-man play by Doug Donald titled “Jesus, Shakespeare, and Amelia Earhardt Run into a Wall” on Sept. 24-26, a Peace Rally against Gun Violence on Sept. 27 and Sukkoth, the Jewish Festival of Booths on Sept. 29.